I am very late in posting on F1 Insight today, mainly because I looked at the news and realized just how sick of much of it I am. It would be possible to write of Fernando Alonso's childish accusations of favoritism at McLaren and the FIA's resultant launch of an investigation into what amounts to hot air. I could join everyone else in casting the bones to see whether and where Ralf Schumacher will be in F1 next year. And there is the not entirely unexpected wavering of Prodrive on the edge of withdrawal from their entry to the sport next year, the fuss over customer cars, the guessing games over the second McLaren seat for 2008. This morning it all seems silly to me. Formula One does have the capacity for stirring drama and riveting struggles on track, but it also seems to have the ability to set up some of the most ridiculous off track storms in teacups of any international sport. Normally, this is one of the things I like about it but today it seems I have had enough for the moment. My mind drifts back to history and I am reminded of something that happened many years ago that foreshadowed one of the strangest events of this season. It might comfort the Ferrari team to know that they are not the first to have made an inexplicable and seemingly irrational tire choice in a rain-affected race. In 1981, the Brazilian Grand Prix was second on the calendar after the opening Long Beach GP. 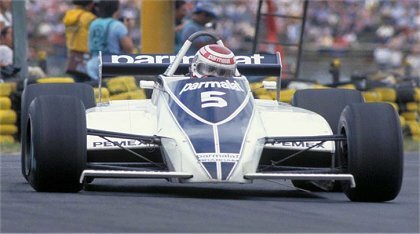 Alan Jones had won that race, confirming his form of the previous year that had netted him the championship in his Williams FW07B; but his closest challenger remained Nelson Piquet in the Brabham BT49C. Nelson came third in that race and arrived in Brazil a strong favorite to win his home Grand Prix, especially after putting himself on pole in qualifying. Rain arrived on race day and the teams consulted their weather experts, sniffed the air and decided that it was there to stay. On went the wet tires. Of the front runners, only one of the Brabhams, the one sitting waiting for its driver in pole position, sported the slicks that meant a huge gamble. It was one of the most unnecessary chances ever taken in F1; with all of his competitors on wets, Nelson would have lost nothing had the rain stopped and a change to dry tires been forced. All would have been in the same boat. But Nelson was adamant. He knew the weather around here, he maintained, and was certain the rain would stop within a few laps of the start. Ah, local knowledge, how fickle a mistress that can be. At the start the field roared off, Piquet slipping and slithering around as he waited for the sun to come out. The field went by, the supreme ignominy happening when Nelson's pay driver team mate, Hector Rebaque, came past him too. But Nelson soldiered on, determined to be proved right. And still it rained. When he had fallen so far behind that it became obvious that, even if it stopped raining, everyone else could change to slicks before he caught them, Nelson was forced to own himself beaten. He came in and switched to wets, eventually finishing in twelfth spot, two laps down on the leaders, still on wets, and with the rain still streaming down. It was an unpromising second race in a season that was to provide Nelson with his first championship and all because of a certain pride in his knowledge of local weather conditions. But there was a sign of how the year was to pan out and come to Piquet in the end. Up at the front, Alan Jones' team mate Carlos Reutemann had won, leaving the Australian in second. This was the reverse of how they finished at Long Beach and it was to continue all season, one taking points off the other in race after race, allowing Nelson the chance to sneak up behind and grab the prize from their hands in the final. Who knows? If history repeats itself, the signs are good that Raikkonen can erase the memory of Ferrari's disastrous tire choice in Japan and come through at the last, as his rivals squabble and spoil each other's chances in the McLarens. would that fate works that way. you're about a month behind me on the burn out trail though.